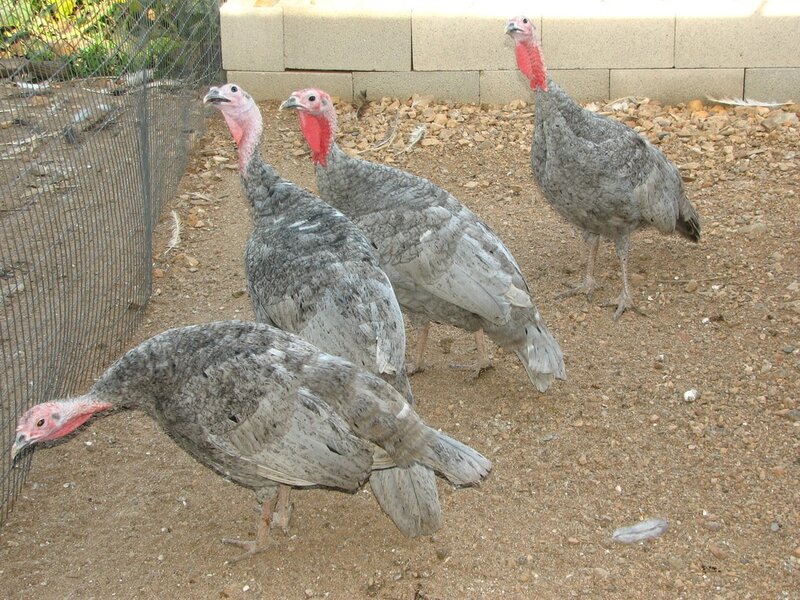 Mottled Slate turkeys have the same blue-grey background coloration as a Slate, but with irregular white mottling throughout the feathers. The mottling will increase with each molt. The hens pictured above are first generation Mottled Slate and are heterozygous for the grey or cg gene. Hens will be just blue and white, toms will be a tricolor mottled slate, with some reddish feathers. Because of their genetic makeup, they will not breed true, these are a cross between a Royal Palm tom and a Self Blue hen, but if you want a breeding combination which will produce a large variety of colors, these will do it. Genotype Bb'CcgDdNn for toms, Bb'CcgDdn- for hens. Not available for 2018, when second generation Mottled Slates will be available. For best mottling, the cg gene needs to be homozygous: cgcg. In 2017, I crossed back to a Royal Palm and successfully selected several pure Mottled Slate as well as Blue Palm. I will be selling these as hatched in 2018, which means you could get Motted Slate, Mottled Lavender, Mottled Black, Blue Palm, Lavender Palm or Royal Palm.